Inspired from Prabir Sir, I am putting forth the travel diary. Basic Structure is copied from his write up (So, due credits to him). Contents are mine. It was a bit long time since when I had not gone for any tour to any sanctuary. When I had no camera, I had visited more sanctuaries and used to be jealous with all guys wielding their white elephants. With time, I have peanuts but not teeth. Anyways, finally after long delay, I decided to go for Gir Wildlife Sanctuary. I was searching for partner for a long time with many guys including here. Everybody was excited but none was ready to jump. Finally, I decided to ditch everyone and stopped asking them 15 days before trip and took wife along. Due to budget constraint, I thought to board trains from Mumbai Central till Junagarh/Vheraval on Thursday Night but after considering the time lag & waiting list for even First AC, I decided to take flight from Mumbai to Rajkot on Friday Morning & Return on Sunday Night. From internet, especially on teambhp, tripadvisor & flicker, there were many tips for this trip. It is absolutely essential to book your safari online at the portal run by Forest department, Gujrat State Government at http://girlion.in/. This portal only secure the permit to enter with vehicle in sanctuary. Guide is mandatory (and useful too) and cost for open Gypsy is to be paid over the counter. Costs for Non Resident i.e. foreign tourist is double than Indians plus Original Passport of Foreign tourists are checked at least 6 times and original photo id of Indians are checked at 4 different points before each safari. Separate fees is must for any camera above 7 Mega Pixel including Mobile Camera, this matter is checked at time of entry very strictly, you may have to deposit your cell phones at entry point if it does not have been booked properly. If you do not have online booking, you have to be personally present at booking counter at two to one & half hours before safari, i.e. at 4.30AM for 6AM safari, 8AM for 9.30AM Safari & 1.30PM for 3.30PM safari. Queues are horrendous and very lumbering experience. Don?t think that by paying bribe you will hire someone from local to do all this. People will promise you for huge amount like 7000 Rs per Safari or like that only to get shooed away by Forest Officers. Remember, very senior & experienced forest officers sit at booking counters and they have a good eye to weed out the local guy posing as tourist. Plus only 15 to 20 permits are issued over the counter, if all permits are sold before your turn in queue, you have to literally beg someone who can share his gypsy with you else have to go back empty handed. Since, I had online booking and we were only two in one gypsy, there were many who were pestering us to take them, many offered higher money also. But, it is strictly recommended that if you have DSLR (oops, sony guys, not for you), you should not have more than two people in gypsy due to short elbow room. There are two rows in gypsy and it really is huge plus if one sits in first row and another in second. This gives room to shoot at both sides. I somehow convinced wife for this for all safaris. Since Flight was at 5.10 AM from Mumbai Airport, I had called the cab at 3.30 AM which was on right time. By 4.25 AM we reached airport and to my surprise, queue for boarding pass was pathetically long, so, we decided to take everything as handbag and went for web check in at Kiosk. After landing at Rajkot Airport at 6.15 AM, I realised that my cab for pickup has not yet arrived. After giving mouthful over the phone call to hotel guy who had arranged my pickup (Of course at extra cost), cab arrived with Tobacco Chewing driver at 7.15 AM. We had a tea break at 8.30 AM on highway. We had a great masala tea at street side stall and we took 10 packets of Thepla for safari & 16 bottles of 500 ml Packaged Drinking water (1 Ltr. Bottle is heavy). Thepla is dry form of Indian bread containing Fenugreek (Methi). We reached hotel at 9.30 AM. After check in, we decided to have 3 hours sleep to make for earlier loss of it. We woke up at 1.30 PM and went for lunch. After light lunch, we left at 2.15 PM for safari scheduled at 3.30 PM. It is recommended that one should not have Punjabi food before safari as it may make you affected with vehicular sickness. Local Kathiawadi food is recommended as local chefs at simpler hotels cannot cook other food properly or you may get to eat the dish prepared from ready to eat package. Foreigner should avoid local food also and should rely on bread butter or sandwiches as everything is too spicy for them. Use of groundnut oil in every dish is very high. Coming back to safari report, we took local rickshaw for pickup & drop at entry point of Sanctuary for every safari. This point is called Simha Sadan (Lion House). For every safari, vehicle, its driver and guide are allotted by Forest Officers strictly on random/lottery basis and one cannot continue with same for another safari. So when we reached the entry point of first safari, it was pretty hot and we had no option but to wait till entry gate opens. After verification of our photo id & baggage check, we entered the forest. Guide started his regular stuff that contained informed that the sanctuary?s name Gir is derived from name of village called Sasangir. It is combined name from two words first being Sasan & second being Gir. ?Sasan? is gujrati pronunciation of word ?Shasan? that means government and ?Gir? is derived from ?Giri Arannya? that means mountain forest. Generally guides have all the same speech which they give to every tourist. He told me that earlier Nawab i.e. ruler of Junagarh Estate was the owner of the entire forest area who had hobby of poaching. Sardar Patel dismissed his kingdom & made that part as India. Last ruler of Junagarh was Grandfather of famous India film actress ?Parveen Babi?. After entry at 3.30 PM, our gypsy went inside from Route No. 7. There are 9 different routes as informed by guide. It is very important to enter for safari at first position, it is very scratchy if one or more gypsy is ahead of you gypsy. Your every snap gets affected, so, very important to enter first. Starting area was full of Spotted Deer, Blue Bulls, Peacock & Hanuman Langoors. Driver and Guide were earlier interested in showing us these species, we told them to proceed further as these species were plenty available. The whole forest, in this season is tinted in brownish grey due to season and dust, so many animal like lion, crocs and many birds get camouflaged easily and difficult to spot. Dust level is incredibly high and strictly to be avoided by people having breathing issues like asthma. From 3.30 PM to 5.15 PM was not that great and did not spot anything superb, I thought this safari is going futile. 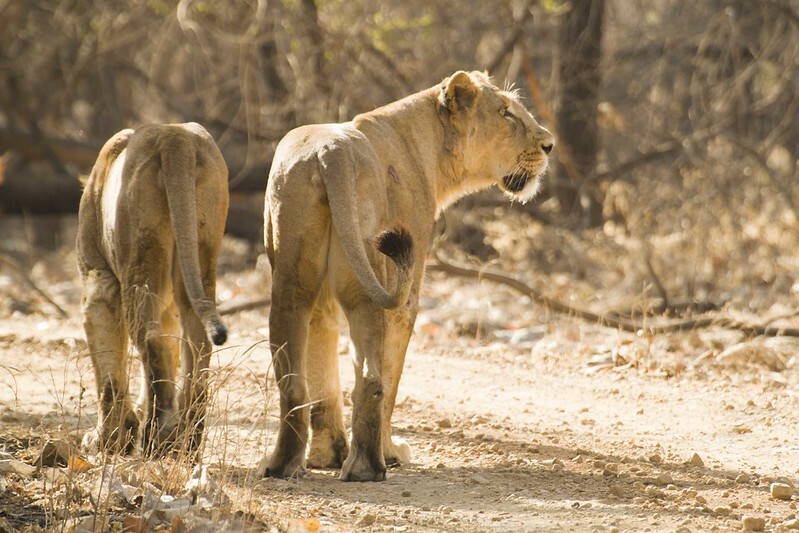 Then suddenly from our left, two lioness made entry on our path. Leading one was younger and elder was following her up. Suddenly we were speechless. They were consistently walking on our route on soiled route intelligently to avoid noise created from their footsteps. We were just following them up for cool 30 minutes for say 1 kilometre long way. They were watching carefully everywhere but did not bother about our stalking existences, they were searching their prey and marking their areas for a long time and distance. After a long walk, they sat aside for a while. 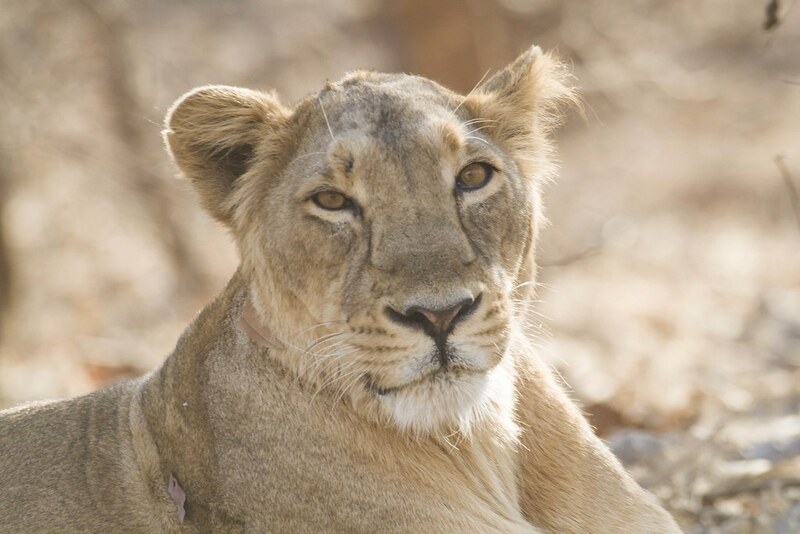 Younger Lioness sat ahead and near to us and facing us & elder on sat behind her and opposite us. It seemed that they were not interested in giving us attention. They even pretended to sleep for a while, but we did not move from the spot and clicking them. Finally, they stood up and started walking inside the forest. We were clicking them till they disappear. In this whole time, no other vehicle was near us and we restricted our guide from informing others. After this, light was fading fast and clock was ticking. So we decided to move out without giving any attention to smaller animals like monkeys, deer, etc. It was 7PM when we came out of exit point. Next day started at 4.45AM when we woke up, after getting ready by 5.30AM, we left for our next safari. We had taken two half litre water bottles and few packets of dry food i.e. Thepla. After getting the gypsy and guide, we brought our gypsy at entry point at around 6 AM. We ensured in every safari that our vehicle was first to enter. At 6.30AM, after all verification processes, we entered the sanctuary from Route No. 2. As there was a while for sunrise and too cold for an open gypsy we told driver not to stop anywhere but run the vehicle slowly. Till 9.00 AM there was nothing much to spot but suddenly, we saw 1 lioness going away from us. She was walking alone and guide told us that she was finding the prey for her young cubs. We got good snaps from behind. She never turned to us even once. After 100 meters walk she went inside the forest area. After this, we got few snaps of vultures in flight and safari ended with some snaps of peacock, deer & monkeys. Next Safari was available & possible at 9.30 AM but we decided to skip it as we wanted to have breakfast at hotel and were feeling sleepy due to early rise. Later, we heard that in this safari, people spotted lioness with cub. We had booking for next safari at 3.30PM, we entered in forest from Route No. 4, as observed in earlier safari first one hour was dull and there was no big animal spotting. At around 4.45PM, we suddenly heard a gentle roar, followed by various alert calls from birds, blue bull & langoors. Our guide told us that some male lion is near, we were so silent that we could even hear our heartbeats. After small distance, 1 big male lion came out from inside forest and sat in the bush under banyan tree. He had brought a deer which was hunted a while ago. He noticed our existence and stopped eating and started observing our mannerisms. We got excellent snaps over 20 minutes from various angles and focal length in various poses. After it, he attended nature?s call and slept for a while opposite us. Still we were shooting him. Then he must have thought enough is enough, he sat in his stylish position and started roaring mildly and started huffing. Our guide counted his huff in 1 minute, it was 38 times huff in a minute. Guide told us that this is final warning before getting aggressive, so, we left from there. For at least 10 to 15 minutes none was talking and just having the feel of lion at so close distance. 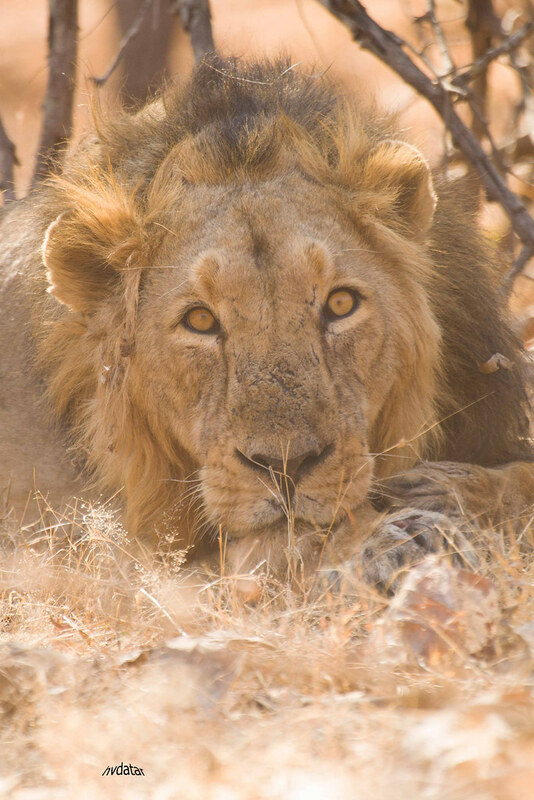 Later on, guide told us, lion was a grown up but young and was one of two sibling and famous attraction since last one year. While return, guide unexpectedly stopped the gypsy at one spot near a water flow that was around 50 meters away at left side of us. There was huge amount of dust in atmosphere so visibility was less. Guide told us to see a big crocodile lying across the area near water flow. It was so camouflaged that we could not spot it with naked eyes at first. After a many instructions from guide, finally we could see from lens. We got some decent snaps of it, but it was very difficult to spot the same. By this safari, our interest in peacock, deer & monkeys was ebbed substantially and told driver not to stop for such animals. After a while, we came out from exit gate. Our Driver & Guide had told us to keep it secret that we got to see male lion especially from forest officials as they ask for tips after this. Feeling extremely satisfied with this safari, we wanted to skip next safari, but we had already booked it. On next day morning, we reached entry point at 6AM and got our next duo of driver and guide. One vehicle was already ahead of us. Guide informed us that he knows guy in that vehicle as some research fella and known to be a bird watcher and expert. He told me his name but will not disclose here. I was curious so we decided to follow them as routes assigned to was same i.e. Route No.6. After a while, that guy stopped his vehicle and brought out his cell phone started playing sounds of female birds. I think he played sounds of 7 or 8 types of birds. Due to which, males of Robin, Cuckoo, Cormorant, Owl & Eagle birds came at our spot and I got snaps of them. That guy was not having camera but had binoculars and was taking some notes. I asked him whether it is legal/ethical to call the birds like this just for our purpose, he shrugged, smirked and told me that I am too na?ve, all big bird watchers and research people do this trick. He went on telling me that people have use sounds of female rhinos, elephants, tigers & lions too to get male animals whether for photos or for poaching and this is an old trick. We were shocked. Later on while moving ahead, at one spot, another vehicle was coming from reverse direction and one lioness was coming in our way and within one moment another lioness joined her in walk towards our vehicle. It was an eye popping experience to see the lioness from half feet. We got good snaps of both of them. But watching lionesses from such distance was a life time experience. We proceeded further after this and got couple of snaps of deer, sambhar & monkeys. With this our last Safari concluded. There are many instructions in every paragraph that cannot be summarised easily so not writing them again. Very descriptive and well written travelogue. Good tips and good pics too . Felt I was there myself. Good photos to go with it! lovely, enjoyed every word and line of it..
Well done, Harsh! Your lucid write up brought the entire Gir Safari in front of my eyes. Thoroughly enjoyed it. TFS. Wonderful travelogue Harsh!!! Great going!! !